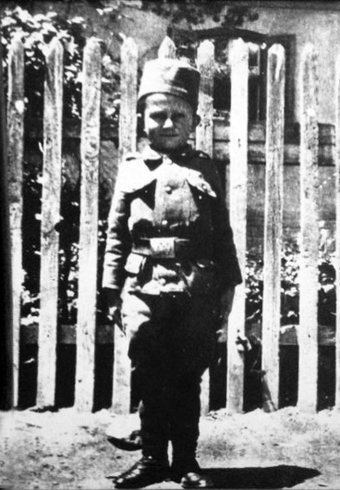 Momčilo Gavrić was the youngest soldier in the First World War. He was born in May 1st, in 1906 in a village near the town of Loznica in Western Serbia, as the eighth child of eleven. In the beginning of the war in August 1914, Austro-Hungarian soldiers have killed his parents and seven of his siblings in a raid that burned his village to the ground. By mere chance he survived the attack and wandered off to find help. He ran into the 6th Artillery Division of the Serbian Army which was, at the time, stationed on Mount Gucevo near his home village. He was taken by the 6th Artillery Division as a war orphan and a soldier called Milos Misovic was assigned as his caretaker. The boy pinpointed the location of the Austro-Hungarians that same evening, and was given control of the trigger of one of the Serbian batteries, which was considered as an act of personal revenge for the death of his family. He was dubbed “The son of the Division”. After that event, he participated in the Battle for Mount Cer, which occurred on 15th of August and lasted for 9 days. It was the first official Allied victory of the war, and also the first aerial dogfight of the war. The battle saw bloodshed of more than 15,000 troops, with additional 50,000 wounded and captured on both sides. 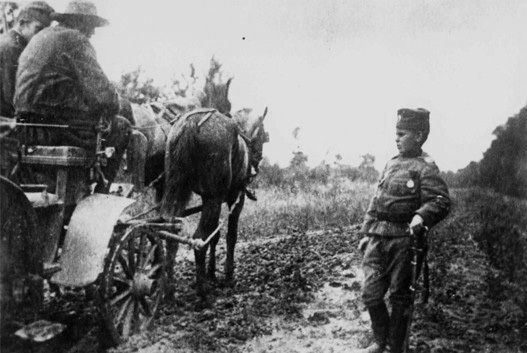 The losses of the Austro-Hungarian army were much bigger than the Serbian opponent and they were pushed back to the Austrian governed Bosnia and Herzegovina, which was their initial position for the invasion. After surviving the Battle of Cer, Momcilo Gavric was promoted to the rank of Corporal and was given a proper military uniform. At the age of eight, he was the youngest soldier in the War and the youngest Corporal in history. After another military campaign against Serbia, in the fall of 1915, known as the Mackensen Offensive, the Serbian resistance was crushed. Serbia was occupied by joint forces of Austro-Hungarian, German and Bulgarian armies, but the Serbian government and Army refused to capitulate. The alternative meant a huge, exodus-like retreat of the remnants of the Army through Albanian mountains, with a goal to reach the Allied territory in Greece, in the winter of 1915. The historical event is often referred as the “Albanian Golgotha”, which illustrates the horrors of the retreat by foot during winter time. Corporal Gavric crossed Albania with the rest of his comrades-in-arms and was given the “Albanian Medal” as a commemoration for his effort. It is claimed that during the retreat his caretaker and friend, Milos Misovic, fell due to exhaustion and asked Gavric to continue without him. The boy refused and curled next to his friend in the snow, which was a gesture that gave Misovic the strength to continue. In Thessaloniki, he was sent to an irregular school program in which he hastily went through the equivalent of four grades of elementary education. 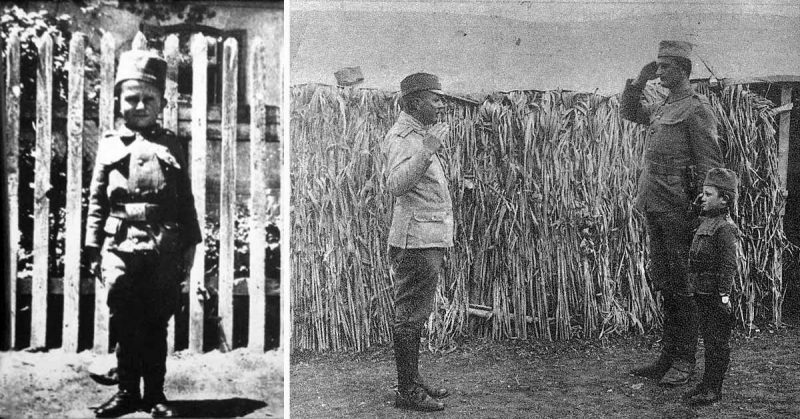 After the recovery of the Serbian Army, he was back in the ranks, participating in the Battle of Kajmakcalan in 1916. 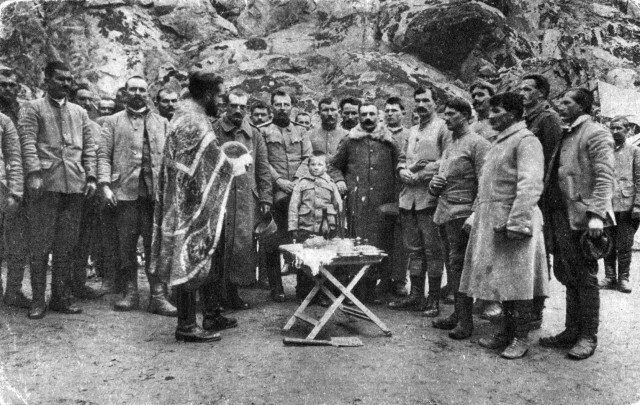 During this particular event, he was met by the Serbian Commander in Chief, Zivojin Misic and promoted to the rank of Lance Sergeant. The order was read out loud to the whole division, as Misic was stunned by the bravery of a ten-year-old boy, and insisted that he serve as an example to the rest of the troops. 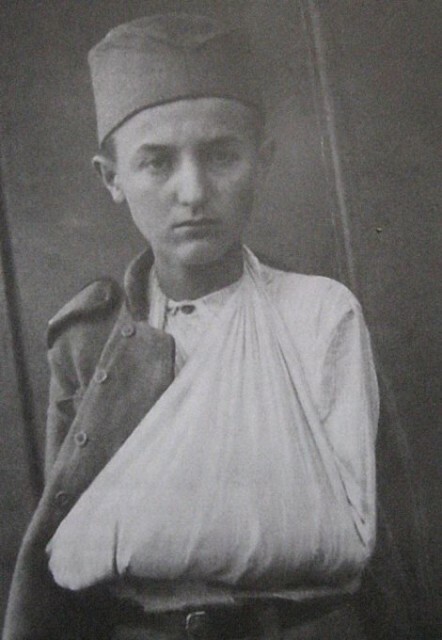 He was wounded several times during his service but continued to go back to the trenches, until the liberation of Serbia was completed and the war was over. He witnessed the creation of a new state, Kingdom of Serbs, Croats and Slovenes, later renamed Kingdom of Yugoslavia. During his legal conscription age, in 1929, he had an incident, after he claimed that he had already partaken in the Army, during the Great War. The officers refused to believe him, and tried to force him to admit that he was lying. He refused to denounce his claim and was therefore imprisoned for two and a half months. Since this incident included his time as a conscript, after prison he continued to serve his one-year army duty. When he left the army, Momčilo returned to Belgrade where he learned the graphic craft, acquired a driver’s license, got married, and found a job in the “Vapa” paper factory. There he worked until the beginning of World War II, when he was drafted into the Royal Yugoslav Army. During the short campaign after which Nazi Germany occupied Yugoslavia, his regiment was captured, but he somehow managed to escape. He settled down for a while in Belgrade, working as an assistant to a Jewish craftsman who managed to avoid immediate deportation. In 1943, both Gavric and his employer were sent to the concentration camp at Banjica, in Belgrade. However, a Police Superintendent, who was a Serbian Nazi collaborator, expressed his favoritism towards the boy hero of the Great War and decided to release him. Being favored by this particular person almost granted Gavric third imprisonment immediately after the war, when he himself was being accused of collaboration by the newly established Communist regime. Luckily, he avoided persecution and spent the rest of his life peacefully. He died in 1993, in Belgrade, at 87 years of age. Momcilo Gavric was given, in the course of time, memorials dedicated to him on the island of Corfu in Greece and most recently a monument in Belgrade. Also, a street in the town of Loznica bears his name.